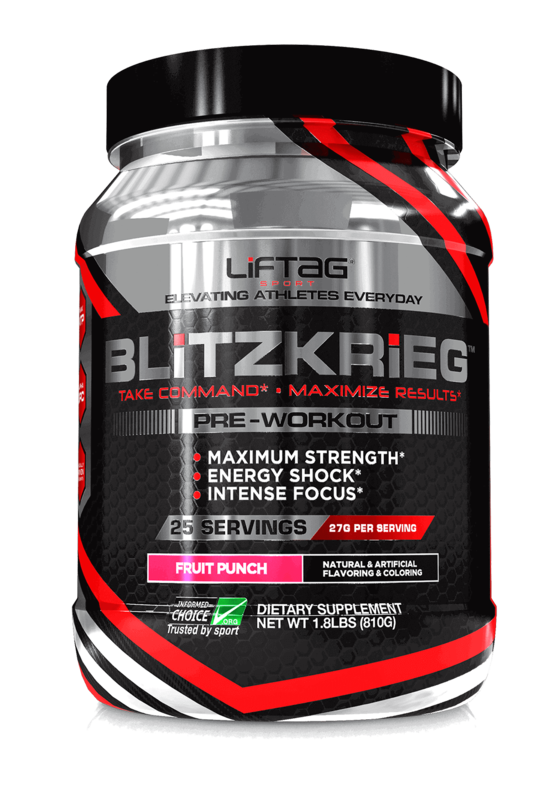 BLITZKRIEG PRE-WORKOUT POWDER delivers a revolutionary blend of ingredients that provides the ultimate pump for an intense workout and lean muscle gains, in and out of the gym. Agmatine Sulfate, L- Arginine, Beta Alanine, and L- Citrulline work together to reduce lactic acid and ammonia buildup during exercise and increase nitrogen production, while creatine monohydrate boosts strength and muscle gains by supporting protein synthesis for increased muscle volume, muscle fiber size and cell volume. In addition, dimethylglycine enhances oxygen uptake by opening blood cells to improve the body’s use of oxygen during workouts. The result is accelerated energy levels, more muscle gain, reduced fatigue and improved recovery time. This unique combination will put your body into adrenaline overdrive, allowing you to achieve your best performance yet. Recommended Use: As a dietary supplement, mix one scoop per 8-16 oz. (500ml.) of water (adjust for taste preferences).